Not every tree with a defect needs to be removed from the landscape. 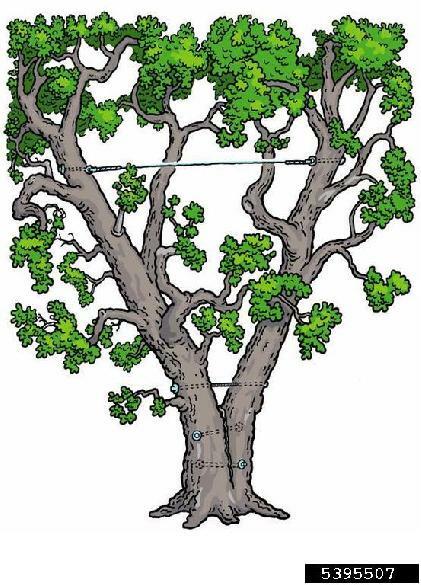 Instead, hardware can be installed in trees to support weak unions, over-extended limbs, and loose root balls in order to reduce the risk of tree failure and avoid removals. Proper cabling and bracing methods are based on good location, suitable hardware, and precise installation. The system we choose to install on your tree will be specifically designed to cater to that particular tree’s structure and/or defect. For example, trees with a visible defect such as a crack will usually require a rigid, steel cable, whereas trees with a potential weak point may do better with a dynamic cable that will allow for movement and strengthening of the wood tissues.